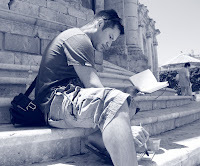 Thirteen years ago, I spent A Year in Provence. Actually it was more like nine months, but 'Nine Months in Provence' sounds more like a gestation period, so better to round up to the more famous Year. In many ways though it was a year that gave birth to who I am now, or at least (to be much less dramatic) helped nudge me in that direction. 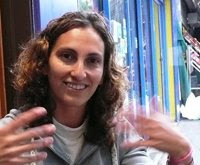 I met my wife in Aix, which directly led to me emigrating to California a few years later. 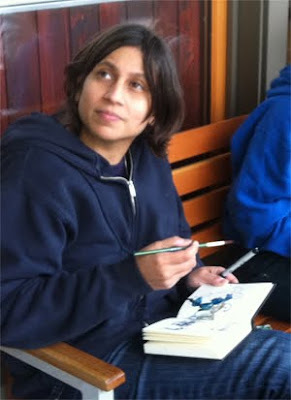 It was here that I also started drawing again, and specifically drawing while out and about on the streets. So when I came back last month after more than a decade since my last visit, it was like coming back to where it all began. I got to visit all the old places I used to love, got to eat poulet-frites, and got to sketch a lot of places. I walked around with my head full of memories, though the main thing I was remembering was to look down at the street in case I trod in dog poo. Above, that is the Place de l'Hotel de Ville, the main square of Aix's old town. 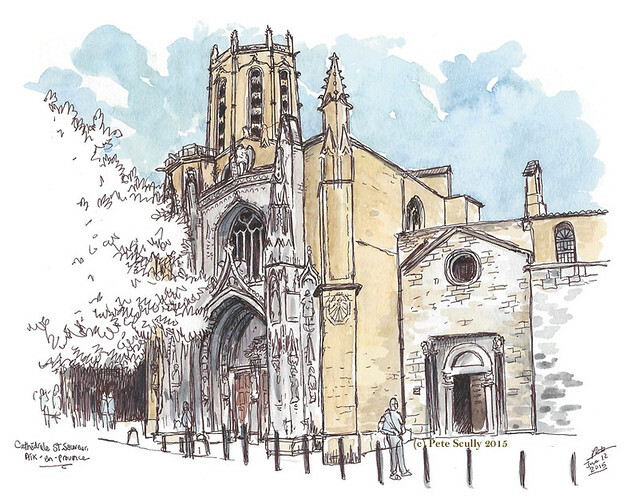 This is where you have to paint or draw if you come to Aix because this is an artist's town. This is Cezanne's town. I met a lot of artists while I was living in Aix, and art students from across the world (mostly America). 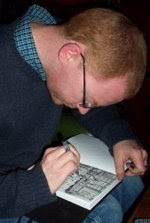 At the time I was mostly working with performance art so to be around people who drew and painted (and cut things up and stuck them back together - these were fine artists) inspired me a lot. However what I think of mostly when I see the square above are the 'Dog People', a group of people who would hang out in the square at night, sometimes playing those big jambee drums, accompanied by a pack of dogs that would run around the square not minding any of the people. I didn't see the Dog People this time, but then everyone I knew in Aix years ago has moved on. The Cat People were still here though. 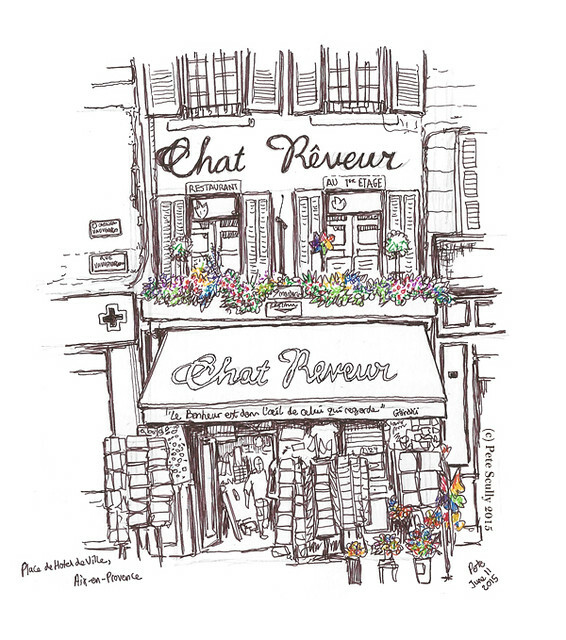 'Chat Rêveur' was a shop I used to always get a kick out of, selling lots of cat-themed items. While they seem to have cut back on their feline focus, it was nice to see this store still in business. 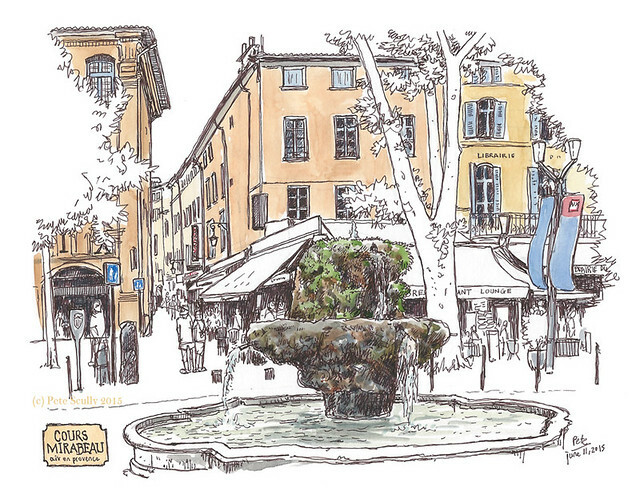 Aix-en-Provence was founded by the Romans in 122 BC, and the name comes from the spring waters (or 'Aquae') which were in turn named after the Roman Consul Sextius (the Latin name for Aix is 'Aquae Sextius'). 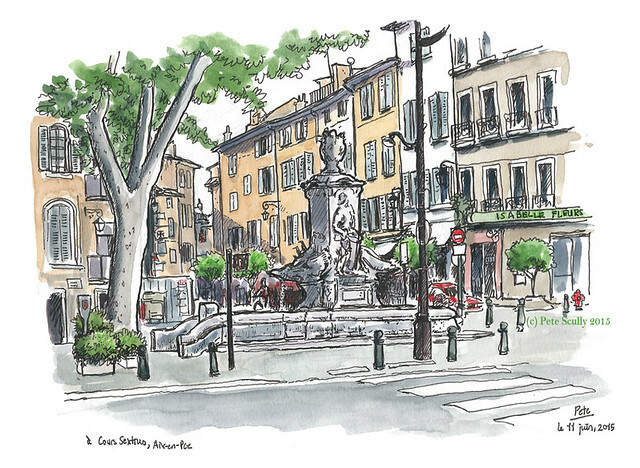 You'll find fountains bubbling up around town, and the ones on the Cours Mirabeau, Aix's main thoroughfare, are old and covered in moss. This one is the Fontaine des Neuf Canons, which dates from 1691. The Cours Mirabeau is on the ancient Roman road linking Arles with Italy, and these days is the wide-sidewalked touristy-but-not-too-crowdy dividing line between the old town and the still-fairly-old Quartier Mazarine. 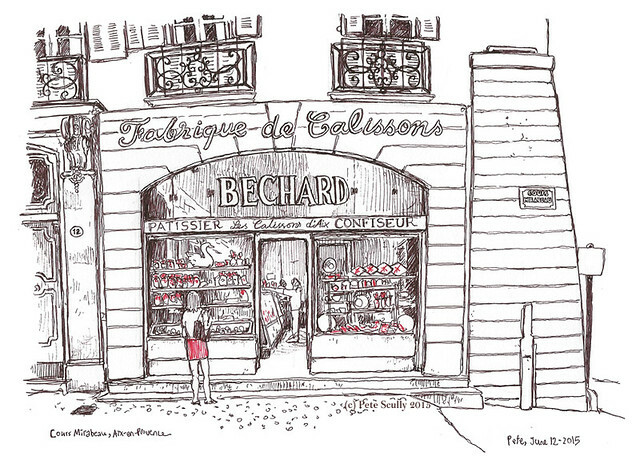 On the Mazarine side, nearby to the cinema (where, incidentally, I first saw both Lord of the Rings and Harry Potter), is a fancy little shop called Bechard which makes and sells 'Calissons d'Aix', a local specialty. They are little diamond-shaped candies made of candied fruit and almond paste, and you have to buy them, just because you do. I don't think I ate a single Calisson while I lived in Aix, but of course I got some to bring home, for old time's sake. I sketched it below. You can just make out the diamond shaped calisson boxes with red ribbons in the window. Below is the Cathédrale Saint-Sauveur, dating from the twelfth century, located uphill from most of the old town. Below, the corner of Cours Sextius and Rue Van Loo, both of which are named after famous water features. Cours Sextius is a traffic-heavy, tree-lined street leading up to the old Roman Thermes Sextius. 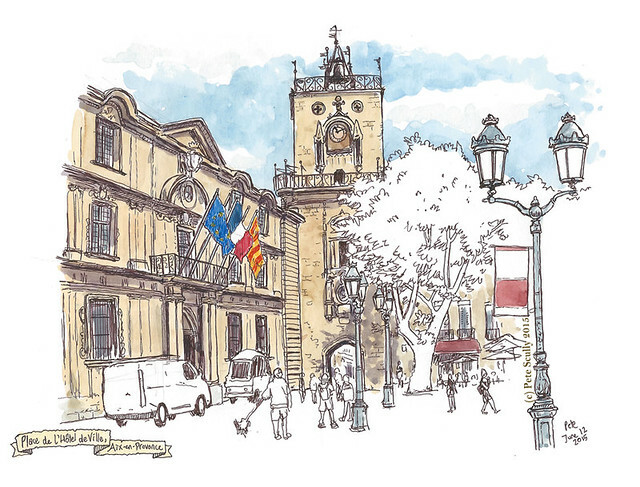 Aix is no sleepy town, but is a bustling and lively place, the historic capital of Provence. I stood and sketched outside the old Bistrot Aixois, a bar that was popular when I lived there but has now closed down. I shed no tear, that was not my favourite place in Aix. Across the street you can just make out a small red object which, to my surprise, was a fire hydrant. 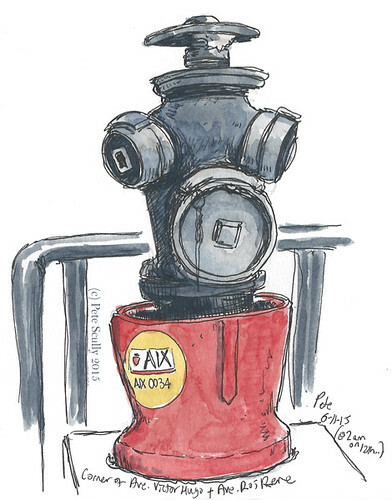 Yes, Aix has fire hydrants, and I had no idea. I obviously wasn't interested in them when I lived there back in 2001-02, they were just invisible to me, so it was a nice surprise to see a few varieties when I came back. 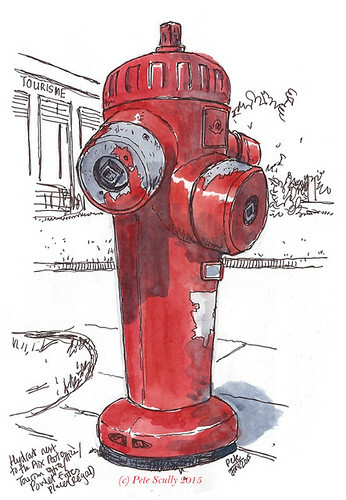 Here are a couple that I sketched; the one on the left is located outside the post office, next to the place where I get my beloved poulet-frites; the one on the right was sketched at 2am, on the corner of Boulevard Roi Rene (named after the last King of Provence) and Avenue Victor Hugo (named after two bungling cartoon criminals). 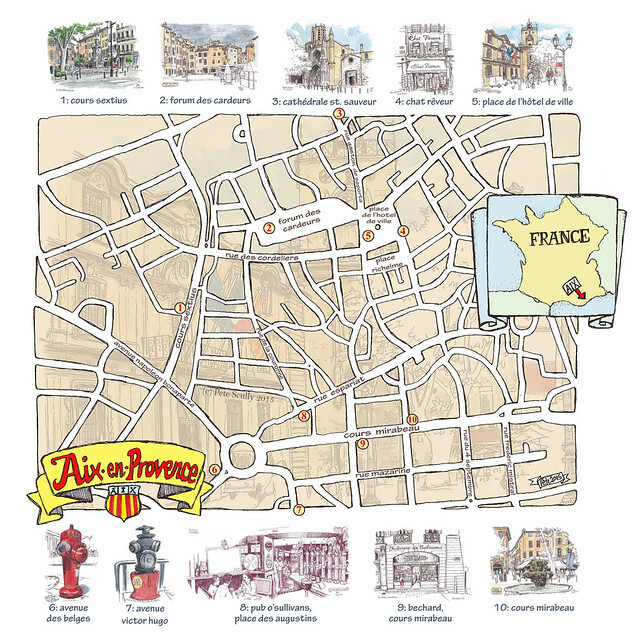 I drew a map of my Aix sketches (I've even blogged about my trip, with comparisons to my old sketches). 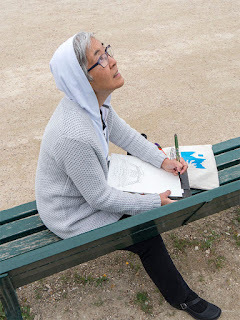 It was a brief visit, just one night, and as I left town a massive thunderstorm nearly stopped me from connecting with my TGV to Strasbourg, where I was headed for the 3rd Urban Sketchers France National Rencontre. Mais je reviendrai!